This 'one direction' tour (no it wasn't Harry Styles and Co in concert) started off as an ECS move from Carnforth to Bristol Temple Meads for our Looe Brush railtour the following day. However, with an interesting route in prospect it was thought perhaps 70 or 80 would take advantage of it being opened up to passengers, particularly with the line through Cheltenham Spa closed all weekend for signalling work. In the event over 210 participated (quite a few not on the Looe Brush as it filled quickly) and there was even a raffle which raised an excellent £1,050 for the Brush Type 4 Fund. That group was well represented on the train in Coach 'A', they provided many great prizes for the raffle and were also very keen to buy tickets too. 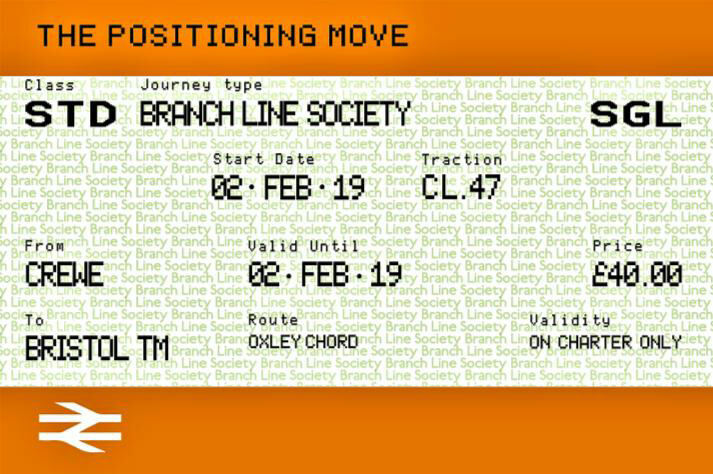 With a flat fare of only £40 and a very sociable 11.16 start from Lancaster, pick ups were made at Preston, Crewe and Stafford on the aptly named 'Positioning Move' with two West Coast Railways Class 47 locos, 'top & tail'. 47772 provided the traction all day; 47826 had its turn the following day. Less than 24 hours before the tour left Crewe, 60009 'Union of South Africa' was in steam on P12 waiting to go onto depot. It's a case of catch this loco while you can as it will be withdrawn at the end of April; the owner intends to display it on his Balbuthie estate from the end of next year. Less than 24 hours before the tour left Crewe, 60009 'Union of South Africa' was in steam on P12 waiting to go onto depot. At 13.15 on 2 Feb the rather less well known, 47772, pulled into P12 in the sun, sporting 'Brush Type 4 Fund' and the red with silver lettering 'Branch Line Society' headboards. This 'Birthday Brush' (build date 1 Feb 1965) celebrated its 54th birthday the previous day. It carried four different numbers over the years and was named 'Sir Gwynedd/County of Gwynedd' from 31 Oct 1982 to 22 Dec 1993. At the rear, 47826 the younger brother, at only 53 years old, had also carried four different numbers and was named 'Springburn' 10 May 1989 - 3 Oct 1990; 31 Oct 2001 - 31 Jul 2007 & 16 Jun 1987 - 10 May 1989. 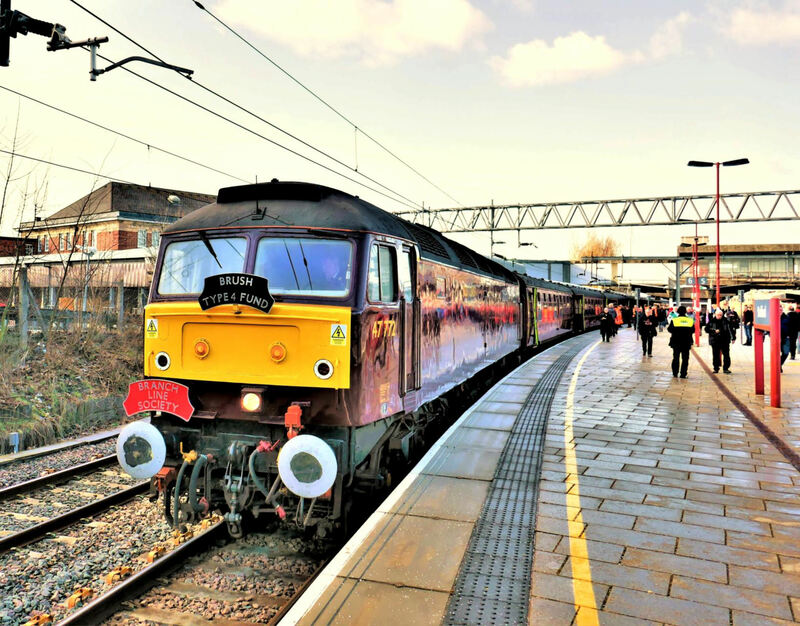 Brush Traction built a total of 512 Class 47s at either Crewe or Loughborough between 1962 and 1968, making them the most numerous class of mainline loco on the British Rail network. 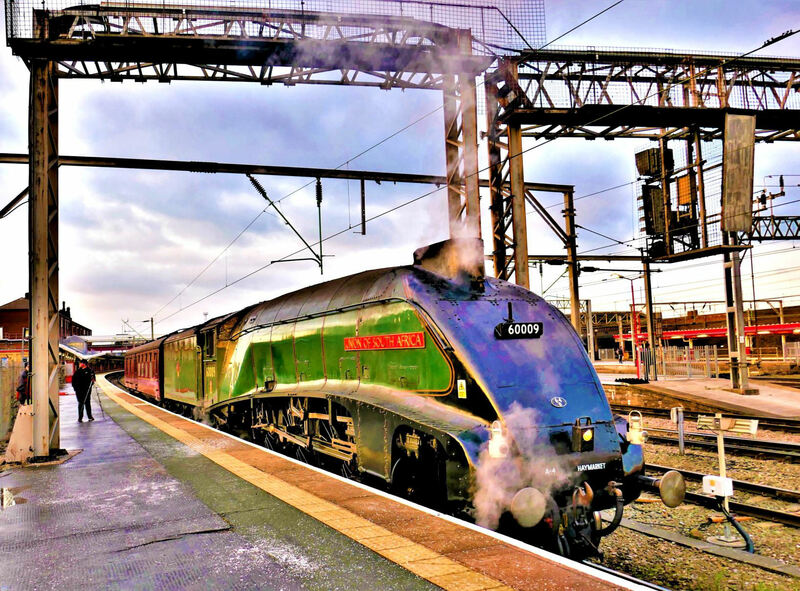 This meant that they were to be found almost everywhere; this ubiquitousness earned them the nickname 'duff' as they inevitably cropped up on trains that the general haulage fraternity wished they hadn't - except those without a steam heating boiler, of course! However, from the perspective of their operators, British Rail, they were one of the more reliable and successful types, borne out by the fact that in 2018 there were still 24 Class 47s operating revenue earning trains on the national network. As might be expected the route to Bristol was not the shortest and involved some rarely used (by passenger, indeed by any trains) curves and one or two loops. The last pick up was Stafford where we waited at P6 for a Liverpool to Birmingham New Street EMU to pass. On departure we then waited time at Rickerscote on the Up Penkridge Slow for a Manchester to Bournemouth Voyager to go by. 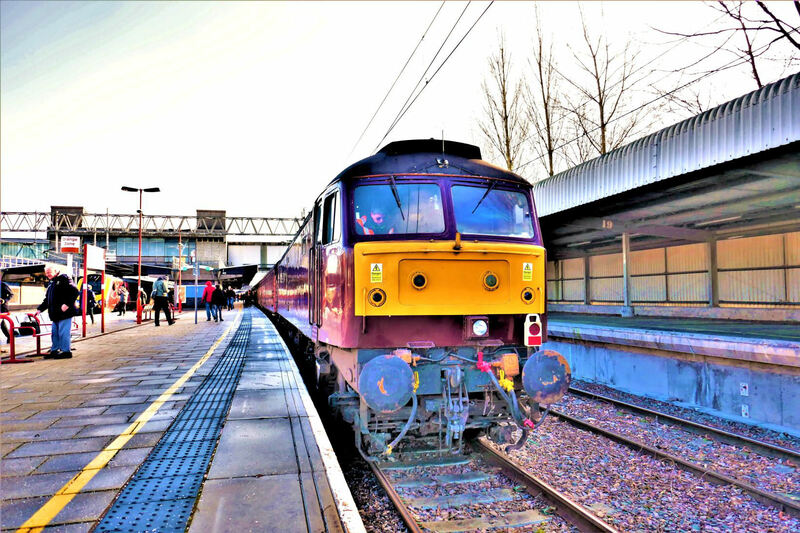 Stafford P6 and the Up Penkridge Slow (the former Up Birmingham Slow) now see very few passenger service trains. P6 used to have daily activity with AM4 EMUs on services between Stafford, Stone and Manchester Piccadilly departing from the northern end and departing to Birmingham from the southern end. Once AM4s ran hourly all stations (even Norton Bridge) New Street to Manchester on this route! On our way to South Wales we took in Craven Arms Down Goods Loop and stopped at Hereford to change crew. The day had been cold but clear of snow, although as we ventured further south more and more snow could be seen on the hills and lower lying areas. Darkness fell as we approached the Newport area, taking the single bidirectional line Hereford Loop then cross over to run through No2 Reception Line at East Usk Yard. This local freight hub stabled locos and wagons during the Bristol Parkway blockade in Sep 2017 and was similarly used for the more recent Filton re-quadrupling. 47772 at Stafford P6 looking north, left is the bidirectional Stafford Goods Loop through the former Royal Mail Terminal 'P7'. The other end of the train looking south with 47826; the former Royal Mail terminal platform is to the right. We were relieved to take the Up Relief over the Bishton Flyover and by Magor the tour was a few minutes ahead of schedule. However, this was all set to change when we came to a halt just short of Severn Tunnel Junction. For around 20 minutes we sat in sub zero conditions outside, although the train heating was working well. The original plan had been to use the Up Pilning Loop followed by a run down the newly reinstated Down Filton Main into Bristol Temple Meads P6. However, NR Western had just implemented their 'Key Route Strategy' due to the adverse weather - this prohibits any points being reversed unnecessarily in case they won't normalise after. To compensate, our Marching Crompton II (Sat 23 Mar) is booked to do the loop with an extra pick up at Severn Tunnel Junction. For the same reason we then took the Down Filton Relief instead of the newly relaid Down Filton Main from Horfield Jn into Temple Meads, reached three minutes early! Nevertheless, for a stock positioning move we had the pleasure of being hauled by a veteran Class 47 on an interesting and unusual route. The (real) ECS was later seen recessing in the Middle Siding (reached via the west end ground frame).